When it rains it pours! Not only were we treated to an article on how fat and grotesque King Henry VIII was, but now we get to see Oliver Cromwell's death mask...warts, crooked nose and all (mmm...pretty)! But, wait...that's not all!! Ol' Ollie C's "grizzled, lumpy face" can be yours for a minimum of 1,000 pounds! The 350 year old death mask (made of plaster cast) is actually either one of the six originally made or a copy of one of them and is being put up for auction by a private collector. "Mr Lely, I desire you would use all your skill to paint your picture truly like me, and not flatter me at all; but remark all these roughness, pimples, warts, and everything as you see me. Otherwise, I will never pay a farthing for it." 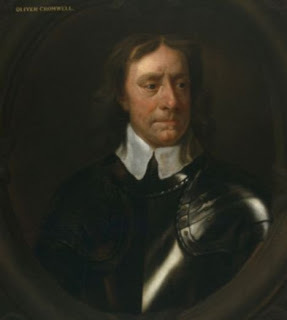 A bit of history...Oliver Cromwell was Lord Protector of the Commonwealth from 1653-1658. He was a strong supporter of the trial and execution of King Charles I, believing that to do so would put an end to the civil wars. 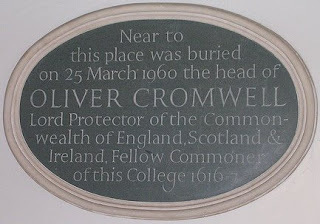 Three years after his death to the day exactly of Charles I's execution, Cromwell's body was exhumed, hung and his head on a spike for all to see. Click here to read the article and to see a picture of the death mask. And here to read more about Oliver Cromwell. I saw one of them - I think it was at Warwick Castle but I'm not 100% on that. I thought it was pretty gruesome, actually, and I definitely wouldn't want to own one. Interesting to see though. Not a very pleasant fellow, I don't think, alive or dead. I read this article too...and saw the mask- what else are we gonna get? It's really gross, if you ask me. And lately, is it just me, or is this becoming the new thing to desensitize us? Ok, that is not a handsome man - and his death mask is even more repulsive! Meghan: so jealous you were at Warwick Castle! And no, owning one of those is not on my list either! Lynn: you hit it on the bullseye! Ms. Lucy: I think they're just catering to the public's morbid fascination! Alyce: he sure was not...no wonder he was such an angry little man!